I like beer. Chances are you do too. Actually, there's more than a chance, there's probably a pretty good certainty considering the popularity of local breweries nowadays. Of course, some local breweries are more popular than others. One of those local breweries that has drawn national- nay, international attention- for their beer has been Russian River Brewing Company, based in Santa Rosa, CA, about 40 miles north of San Francisco (which used to be a 40 minute drive, and now it's an hour-plus. But I digress). If you like beer, you have heard of them. You probably know about them because of their limited release Pliny the Younger, a Triple IPA that has won a zillion awards and every year causes beer fans to line up for hours around the block to consume it (and then it's randomly available at restaurants that don't advertise they have it so you can just slide in and get some- trust me because it's happened). 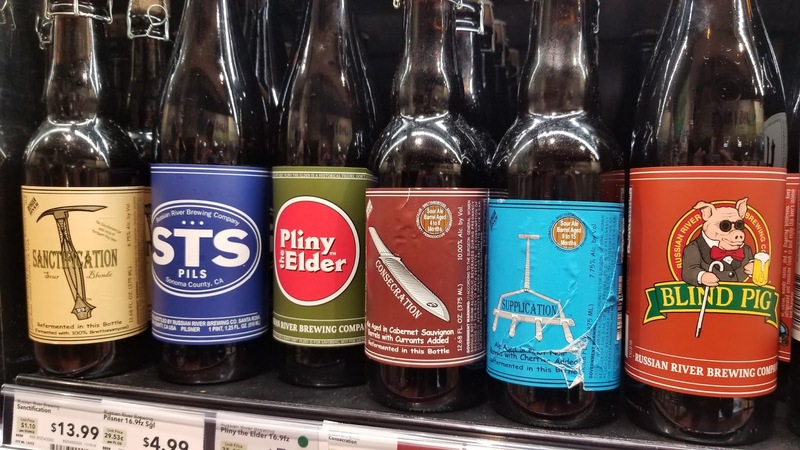 Now, their notable year-round release is Pliny the Elder, a Double IPA that hard to find outside of Northern California, with the occasional jaunt into Southern Oregon. It is even difficult to find outside of their home base of Santa Rosa. 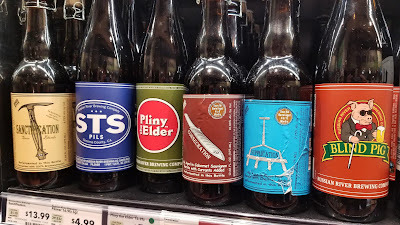 I do not live far from Santa Rosa, and yet for a long time one needed to know the weekly shipping day of Russian River Brewing in order to get bottles of Pliny the Elder at the store nearest to me. And there is an enforced two-bottle limit per person. Yes, two bottles per person. It feels like rationing because it is. At least Pliny the Elder has been available in bottles, even with that limit. Other RR brews, such as Blind Pig, a mere "regular" IPA, were simply impossible to find in bottles anywhere. (Although the bar attached to the home of the San Francisco Giants, Public House, nearly always has Blind Pig on draft and available on game days). In many ways it's been more fun to have Russian River beers challenging to find. Because they insist on freshness and constant refrigeration for their brews, their distribution area has been limited. As a result, when I find one I am more than likely to get it as opposed to something else, because it makes the product more desirable. I am certainly not alone in this thinking, and have named and written about the phenomena "Enforced Scarcity." This phenomena is not limited to beer that you can't get in a lot of places, although it is certainly one of the easiest ways to explain it. The surge in popularity of "In-N-Out Burger" over recent years is another example. Simply, people want what they don't have easy access to. You can get a Big Mac everywhere, you can only get a Double Double some places. Thus, Double Doubles are more attractive than Big Macs, even though they really are the same thing. "Wealthy Texan Big Enos Burdette and his son Little Enos seek a trucker willing to bootleg Coors beer to Georgia for their refreshment... 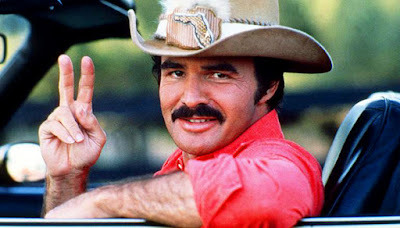 They find local legend Bo "Bandit" Darville... and offer him $80,000 to pick up 400 cases of Coors from Texarkana (the closest place it could be legally sold at that time), and bring it back to Atlanta in 28 hours." Yes, Virginia, there was a time when Coors beer was a desirable product because it was hard to find outside of major shipping lines. It was a story similar to RR, where the folks in Golden, Colorado insisted it be shipped refrigerated all the time, which limited their distribution path. I remember, and I swear to you this is true, my uncle from the great Pacific Northwest wanting to drink nothing but Coors when he came to California on vacation because Coors beer was unavailable north of the California border. This is true. The question, then, is what happens to the popularity of something rare when it becomes commonplace? Will it lessen the appeal of the product, or will that make it more popular? In many cases there is an initial surge and then a drop-off, although a steady climb back to surge levels and beyond it is certainly possible. You pass Coors in the store wherever you are nowadays and don't give it a second thought because it will always be there. There was a time not so long ago when it wasn't, but you don't go around coveting that yellow can, do you? I have never actually been inside their original downtown Santa Rosa brewpub for every time I am in Santa Rosa there seems to be something going on that would cause it to be overflowingly full. I am not interested in peak capacity crowds, I am interested in being able to stretch out for a bit. Russian River opened their Windsor brewpub in August, with moderate first-day expectations. The place seats about 200, there's a dedicated parking lot, and they figured that would take care of everybody who wanted in. They were wrong. In a couple of hours the parking lot was completely full and close to 1,500 people who like beer wanted inside. That takes care of the surge. Having not attempted to visit the new place I can't tell you what the line looks like now, but I expect it is a bit smaller. And today I saw proof that the production line is up and running and Enforced Scarcity is no longer going to be an issue for RR in the Bay Area- it's that picture at the top of the column. Both of their standard year-rounders in bottles (Pliny, of course, but also the 1st time I've seen Blind Pig in a bottle in a store) and some of their even rarer brews that may now become commonplace- Consecration, Sanctification, and Supplication, and STS Pils (which I don't believe I've ever had before). Which leads to the question- will more RR beer becoming available be a bad thing? Coming from a place of scarcity, that seems like a very silly question. Of course not, is the first response. But if it becomes readily available, and consistently, will you want Pliny or will you want something else? You're right, it is a silly question. More Pliny will never be a bad thing.